DOT Recognizes Deaf and Hard of Hearing Truck Drivers! In a historic victory for deaf and hard of hearing truckers, the United States Department of Transportation (DOT) announced today, after decades of prohibition, that deaf drivers can operate commercial motor vehicles such as large trucks. Today, the DOT granted 40 applications filed by the National Association of the Deaf (NAD) seeking exemption from the hearing standard that has barred deaf drivers from obtaining commercial drivers’ licenses (CDLs). In announcing this historic decision, the DOT cited research demonstrating that deaf drivers are as safe as hearing drivers. 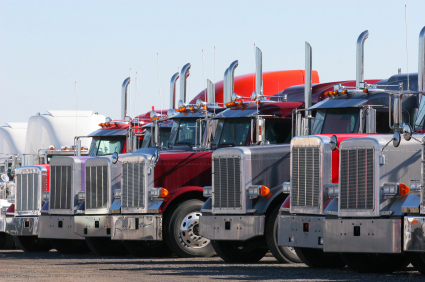 The DOT regulates the physical qualifications standards, or physical requirements, for people who want to operate commercial motor vehicles in interstate commerce. For decades, the DOT has maintained a hearing standard that has excluded safe and skilled deaf drivers from a career in commercial trucking. The DOT hearing standard, contained in 49 C.F.R. §391.41(b)(11), requires that a CDL applicant be able to hear a forced whisper in the better ear at not less than five feet, or that an applicant does not have an average hearing loss in the better ear greater than 40 decibels at 500 Hz, 1,00 Hz, and 2,000 Hz with or without a hearing aid. The NAD has long argued that this standard has no relevance to safe operation of commercial motor vehicles and has insisted that the DOT rescind this standard. 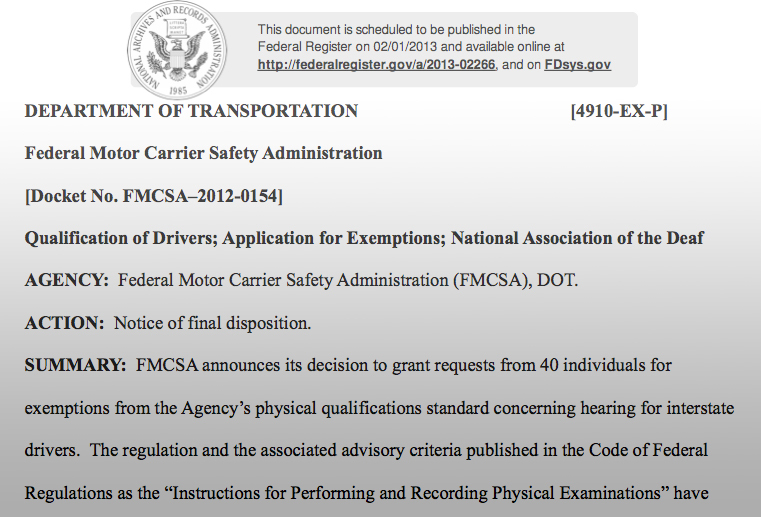 In July 2011, the NAD filed exemption applications asking DOT to waive the hearing standard and allow deaf truckers with safe driving records to operate commercial motor vehicles. In February 2012, the NAD submitted a second group of applications for exemption. The DOT reviewed the driving records of each exemption applicant and asked for public comment on the exemption requests. In response, 570 individuals and organizations filed public comment, overwhelmingly agreeing that deaf people should be allowed to obtain commercial drivers’ licenses. The NAD expresses gratitude to these individuals and organizations that filed comments supporting the exemption petition. Today’s announcement not only allows the 40 applicants represented by the NAD to drive commercially, but opens the door to driving careers to any deaf driver with a safe driving record. The DOT explicitly states that this announcement pre-empts any contradictory state law. “We made history today, and this is a huge victory for all deaf and hard of hearing people in the United States. Previously we had to fight to be able to drive cars, and now commercial driver’s licenses are available to deaf and hard of hearing drivers!” says NAD President Christopher Wagner. In addition to granting the 40 exemptions, the DOT recognized that the NAD has filed a petition to remove the hearing standard in its entirety from the regulation. That petition is currently under consideration by the DOT. The NAD thanks the DOT for issuing the 40 exemptions at this time and urges the DOT to expedite the petition to remove the hearing standard. The NAD expresses gratitude to many people who worked hard for many years to reach this achievement including but not limited to: deaf truckers and their organization Deaf Truckers United; Mary Vargas and Michael Stein at Stein & Vargas, LLP; and Thomas Knope. To read the Federal Register granting exemptions for these 40 individuals, visit the United States Department of Transportation website.